The first change to Buffalo’s coaching staff has taken place this offseason. Bills assistant offensive line coach Kurt Anderson has announced he’s leaving the Bills to take over as offensive line coach at the University of Arkansas. Anderson made the announcement on his Twitter account. Anderson was instrumental this past season in coaching Buffalo’s offensive line while offensive line coach Aaron Kromer serves a six-game team-imposed suspension. Head coach Rex Ryan praised Anderson’s efforts in Kromer’s absence. Buffalo’s offensive linemen also had a good deal of respect for the up and coming assistant coach. Arkansas alum and TE Chris Gragg also expressed his excitement that his alma mater was getting Anderson as a new assistant. Anderson also gave props to his Buffalo Bills family. He helped the team pull out a one-point victory with under two minutes to play, so it’s not surprising that teammates of EJ Manuel felt he showed a lot on Thursday night. Andre Davis who caught Manuel’s touchdown pass on fourth and goal was taken by Manuel’s cool persona during the most stressful part of the game. Rookie RB Bronson Hill, who capably protected against the blitz liked Manuel’s demeanor in the huddle. Buffalo’s two road wins haven’t been pretty, but in the end the Bills emerged victorious needing overtime in Week 1 and a 58-yard bomb from Dan Carpenter in Week 5 to beat a pair of NFC North opponents. As the players see it, the hard fought victories are strengthening their mental toughness. With Lee Smith injured and Tony Moeaki still not 100 percent fellow TE Chris Gragg figures to see a lot of playing time against the Lions. Gragg hasn’t seen a lot of time with the starters, but that’s going to happen in the preseason finale. Gragg is going to start with Scott Chandler also inactive tonight. In this final preseason game, Gragg just wants to tighten up some of the nuances of his personal game. “Really just my details,” Gragg told Buffalobills.com. “I want to be focused on every play, not to have little mistakes. I haven’t had any big outrageous mistakes, but little things. Stepping this way or making sure I catch the ball with my hands and tuck it under my outside arm. It’s some of those little things that we’ve been harping on, those are the things that are going to help us get to that next step. Gragg has heard coach Marrone’s call for the other players on offense to be better around QB EJ Manuel. The second-year tight end knows what his head coach means. Chris Gragg to practice soon. Bills head coach Doug Marrone confirmed that Chris Gragg is out of the hospital, but he is not going to practice right away. Gragg is in attendance at the Friday night practice. Bills FB Evan Rodriguez has missed the past two days of practice due to complications from cramps along with TE Chris Gragg. Head coach Doug Marrone provided an update on the fullback’s status. Marrone said that Rodriguez had been released from the hospital where he apparently spent Tuesday getting effectively hydrated. Gragg was also hospitalized, but according to the team has not yet been released. Three weeks of OTAs are over. Only the mandatory minicamp remains next week before the countdown to training camp. As always we’ll have full coverage here on Buffalobills.com. Here now are your latest questions from email at AskChris@bills.nfl.net and on Twitter @ChrisBrownBills. I am hearing a lot of fans chatter about the Bills running back situation. It’s come to be pretty crowded at the RB position at this point and since the Bryce Brown trade fans seem to think CJ is on the trading block? I don’t buy it myself. I know that CJ and Fred are FA’s in 2015 and while it makes me very sad I tend to think that will be it for Fred Jackson. As for CJ I don’t really know if they would like to lock him up long term. I wanted to get your thoughts and see if you have a feel for what they might want to do. My take is they brought in Bryce Brown because they liked him but also as insurance for the season and to see what he’s got. I would also imagine that if they do like him after the year that he would most likely be Fred Jackson’s replacement. To me CJ Spiller is more than just a running back and I do not believe that he has even scratched the surface of what he can be. He’s a threat every time he touches the ball and I’m very optimistic that he is going to shine this season. As long as he stays healthy and the coaches put him in the right situation he should be able to really show what he can be. Like Sammy said I hope that I see CJ and Sammy play together for a long time to come. And also what do you think of CJ’s contract situation and the RB market? Do you think that could be beneficial for the Bills or could CJ still demand a hefty contract maybe pending his season? CB: I think with the pressure on everybody at One Bills Drive to win this year and make the playoffs the thought of C.J. Spiller being on the trading block is absurd. Yes, C.J. is entering the last year of his contract. It’s my understanding though that Spiller wants to stay in Buffalo long term. For him to sign a long term extension now however, would not be in his best interest. He’s coming off an injury-plagued 2013 and the new offense took some getting used to. Spotrac.com recently did a great job projecting a long term contract extension for Spiller based on what he’s done in his career to this point and presented a lot of good comp numbers from other backs in the league. Spiller presumably would want more than the $4-plus million they project, and to do that C.J. has to approach, or more likely, exceed his numbers of 2012 (1,244 yards rushing, 459 receiving, 8 TDs) to be able to negotiate more. At this point Spiller is without an agent though he’s looking to hire one in the not too distant future. It’s my belief that both the Bills and Spiller will let the season play out and regardless of his production they secure a long term agreement that’s beneficial to both sides. I will add that I am encouraged that offensive coordinator Nathaniel Hackett will diversify the ways in which he uses Spiller in the scope of the offense. I personally love the trade to go up and get Watkins, and right now after rookie camp, it looks like he is the real deal. This year is also the year that Stephon Gilmore is supposed to make the jump to an elite cornerback. With minicamp coming up and I’m expecting them to match up against each other, what would the coaches rather see? Watkins showing he is the real deal, but also Gilmore might not be the cornerback they hoped. Or would they rather have Gilmore shut him down, but also raise doubt about whether Watkins was worth what they gave up for him? Thanks for all your coverage and GO BILLS! CB: In an ideal world for the coaches their head to head play raises the level of both players. That’s the competition that coaches and GM Doug Whaley have talked about all offseason. When the competition level is raised it inherently raises the game of the players involved and that makes the team better. Gilmore however, is not expected to get a full workload in the team portions of practice next week. Coming off of his surgery he’s expected to be eased back into the practice setting and got a handful of snaps the last week of OTAs. Thanks for the great Bills coverage for all of Bills Nation here in the desert southwest. Given the imminent change of ownership and the potential uncertainty that can bring, what is the mood of the Bills employees at OBD. Are people apprehensive regarding salary and benefit restructuring or can everyone, (including yourself) focus and keep it in the background. Thanks and the best of luck. CB: Our President and CEO Russ Brandon has stated more than once publicly and to us directly that it’s business as usual and we take him at his word. There is no sense in worrying about things we can’t control. So as far as I see it it’s in our best interest to do the best job we can do in the roles that we have until we know more about the future leadership of the organization. Thanks for your concern and well wishes. How do you think the coaching staff views Chris Gragg? We keep hearing the Bills don’t have that “new-age” athletic TE on their roster, and if they do it’s Tony Moeaki, but Gragg has an intriguing skill set in my opinion. Is he a guy that they are planning on trying to get more use out of in his second year, or do you think he has an uphill climb to make the final 53? CB: I don’t think there’s any debate about Gragg’s athletic skill set. He’s done all the right things this offseason including making it to each of the Bills player passing camps run by EJ Manuel in California and Florida this offseason. With Scott Chandler limited he had the benefit of getting some first team reps in a rotation with Tony Moeaki and Lee Smith in OTAs. I spoke to him this past week and he told they’ve expanded his responsibilities in the scope of the offense where he’ll be playing both the ‘Y’ (in line TE position) and the ‘F’ (detached). So there appear to be plans to broaden his role, but he’ll need to outperform both Chandler and Moeaki in camp if he’s going to get any significant playing time this season. Thanks for the great coverage this off-season. I always look forward to Fan Friday. My Question is in regards to the #3 QB spot. 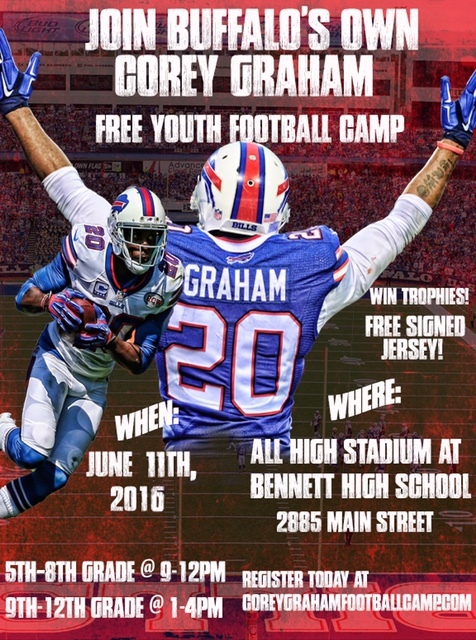 What have Jeff Tuel and, Dennis Dixon been up to this off-season? Tuel showed a lot of promise last pe-season but, clearly wasn’t ready when thrust into the spotlight. I still hold out hope for him. Living in Western Pa. I got to see Dixon play some as a Steeler. The guy has a motor for sure. Do you think Tuel’s spot is safe or does Dixon have a legit chance to overtake him? Maybe try to stash Tuel on the PS? CB: At this point it appears that Tuel has the edge on Dixon for the third QB job on the roster. This offseason Tuel has definitely strengthened his body. He’s leaner, but stronger and it’s showing in his escapes from the pocket when a play breaks down and in his arm strength. Dixon is clearly the best athlete when it comes to taking off and running. He would win the footrace of all four QBs easy. Tuel does have practice squad eligibility, but I’m going to have to check on Dixon. This will be a very hard battle to gauge because their reps on so limited. It’ll likely go all the way to the preseason games before a definitive call can be made. I will say through the OTA practices I thought Tuel flashed more with the plays that he made. Sunday will be the final step in trying to post a winning record in the division for the first time since the 2007 season. Let’s see if the Bills can get their first win ever in Gillette Stadium. Here’s your latest edition of questions on email at AskChris@bills.nfl.net and on Twitter @ChrisBrownBills. Coming into this season knowing the Bills were going to draft a QB and most likely be our starter, I would of thought Coach Marrone was going to bring in a OC with NFL experience and a reputation with teaching young QB’s. I was really shock when he named Hackett his QB coach and OC. I was not thrilled with this move and I still do not think he is the right guy for this job. He does not use the players the way he should , like CJ Spiller who was unstoppable last year and this year he’s been shut down for the most part mainly in the receiving area. His play calling is horrible and his short passing is getting old real quick. Atlanta game Goodwin and Graham both should of had career games as bad as Atlanta’s pass defense was and correct me if I’m wrong but did either one have a catch over 10 yards. he is not the guy for the job and I hope Marrone sees this and fixes this problem after the season. I like EJ Manuel and I feel with an experienced guy working with him he can become the QB this team needed in a long time, I just don’t think Hackett can do this. Your thoughts and thanks for doing a great job. CB: I’m going to disagree with you on this one. I think there is a reason that the Bills were one of the most frequent rushing teams in the league. It’s because they had a rookie quarterback. I believe as the season wore on the hope was that EJ Manuel would progress in his play to the point where they could become a more balanced offense, but that went out the window with Manuel’s midseason knee injury. Now his third knee injury has cost him more time on the field. So running the ball became the offense’s identity, and to their credit they’ve done a great job with it. They lead the AFC in rushing yards per game. This despite the fact, as you mention, that C.J. Spiller has not been the weekly game-breaking talent that he was last season. It’s hard to pinpoint exactly why that has been the case. Spiller by all accounts is pretty healthy now, but his effectiveness as a runner has not improved a whole lot from where he was at when he was dealing with the high ankle sprain. I think in Hackett’s defense he had a lot more to deal with at the quarterback position than anyone anticipated. When Manuel was hurt, he didn’t have a veteran QB to lean on, which was the plan with Kevin Kolb. So he instead he had to invest extra time trying to get another inexperienced QB ready in Thad Lewis and in one case Jeff Tuel (vs. KC). I’m confident that if coach Marrone knew he wasn’t going to have a veteran QB in the room healthy and ready to back up and provide counsel to EJ Manuel that he may have given greater consideration to hiring a quarterbacks coach. Not because Nathaniel Hackett isn’t capable, but because of how much time and instruction would be required to school up three inexperienced QBs. As for Hackett’s qualifications as an offensive play caller, he is more than qualified and I’ll again remind you that with a rookie QB who is learning on the job you are inherently limited in how much of the playbook you can use week to week. CB: Coach Marrone has said it has been their intention to get Gragg as well as Marquise Goodwin more playing time for several weeks now, but it’s been easier said than done. Here were some recent comments he made about Gragg. My question is in regards to the Bills offense. It seems that EJ is becoming more comfortable in throwing the ball “between” the numbers and play action. He threw some nice strikes to Chandler and Gragg against the Jags. Why does it seem that it takes getting into late 2nd Quarter or in the second half to start calling more of those plays? Is it because the running game has to be established first for those plays to be successful? Or is it just the way that Coach Hackett likes to call the plays? CB: Once again I’ll defer to coach Marrone on EJ Manuel’s slow starts in games this season. Here’s what coach said after his most recent slow start at Jacksonville. 4 – Thanks Chris for all your Coverage of our Buffalo Bills! When Aaron Williams went down on Sunday, Jim Leonhard came in and once again made 2 huge plays. It shows how important depth is on an NFL football team. Every time he has played, he has made big plays. Do the Bills make a Valiant effort to resign some of these key backup players like Leonhard? CB: Leonhard has been known for the big play since his college days at Wisconsin. He had 16 interceptions in his college career. He’s a savvy player who makes plays despite not being the most physically gifted safety around. He is a free agent after the season. 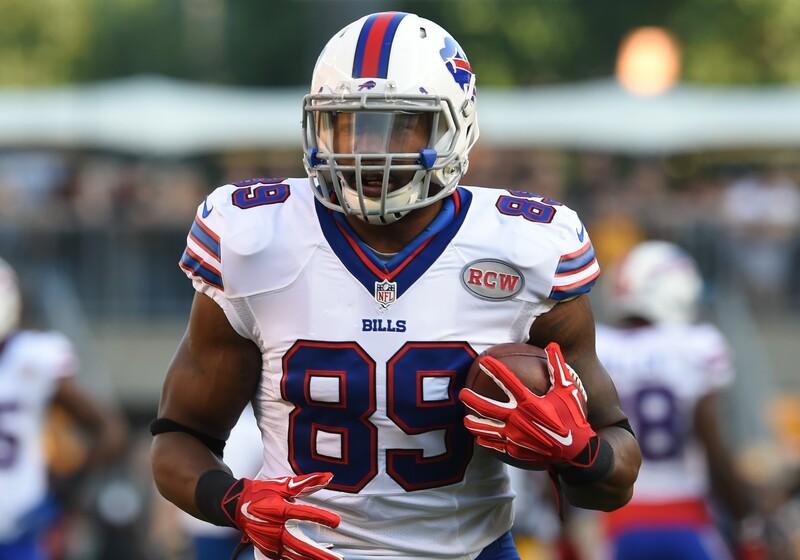 His return to the Bills could be directly tied to what happens with Jairus Byrd another free agent safety for Buffalo. If Byrd is re-signed I think it lessens the likelihood that Leonhard is also back knowing there are two young safeties on the roster in Duke Williams and Jonathan Meeks. If Byrd is not back, then Leonhard becomes a much more viable option to re-sign as I see it. I’m wondering why the Bills are using Graham more than Goodwin? IMO, the Bills are not effectively using Goodwin, as they continue to throw him an occasional deep pass to him every game. In the last Jets game, where Stevie Johnson and Robert Woods were out due to injuries, Goodwin had his best receiving game of the year as Goodwin was catching passes all over the field, and IMO, the Bills had one of their best offensive outputs of the season. I feel Goodwin can be more effective catching passes in the slot, and other parts of the field, besides going for the deep routes a couple of times a game. So far, Graham has proven to be very inconsistent as he has dropped numerous passes, and does not get the same consistent separation as Goodwin does. At this point, it seems EJ Manuel has more chemistry with Woods and Goodwin, than he does with Johnson and Graham. I would rather see Woods and Goodwin as the Bills top 2 WR’s, with Johnson in the slot as this could help Manuel’s development. Thanks for all the hard work that you do covering the Bills! CB: Goodwin has produced when given more time on the field. I think he has demonstrated dependable hands this season even in traffic. The slot might be an interesting spot for Goodwin to line up more often moving forward, though Woods could be effective inside too. The depth chart at receiver that you’re suggesting could shift in that direction going into next season. It’ll all come down to competition at training camp.